Baby Babble is an engaging speech-enhancing video prepared by speech-language pathologists for both you and your precious child. 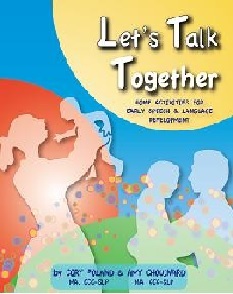 Bonus features include a parent tutorial, sign language tutorial, and speech and language developmental charts-FREE! Baby Babble is made by speech pathologists and is designed to expose your child to early developing sounds and words. The Baby Babble video delights children by exposing them to early developing sounds and words that lay the groundwork for future communication. 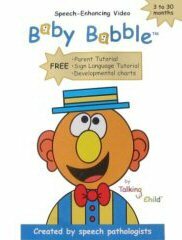 The simple sign language incorporated into Baby Babble provides children who know what they want to say with a bridge for communication until they acquire the skills for spoken language. Captivating facial exercises appeal to children by fostering sound play, encouraging imitation, and developing muscle coordination for sound and feeding development. A 12-step parent tutorial included in the Baby Babble video provides parents with answers to questions such as, "What should my child be saying?" and "What can I do to encourage my child's speech?" Bonus features include a parent tutorial, sign language tutorial, and speech and language developmental charts-FREE!